She looks so different & stunning! Such an adorable photoshoot. She always looks so cute. I love that boxy white jacket with the tiered skirt. love her. thanks for sharing! Love her, she's so gorgeous! So perfect. I love her overall look! Love her. The shoes she is wearing in the 3rd photo are to dieeeeee for! She is so elegant. I'm loving all of these shoes!! She is soo funny! I use to watch her show on MTV. Oh Alexa, I love you. i love alexa's style, she has such an intelligence about her aesthetics, but i wish she would eat a hamburger.... or two, or three. i really like her style, haven't watched her new show on lifetime yet. She's just flawless. I'm in love. Going to have to get my hands on a copy of this issue! LOVE. Isn't she gorgeous? I love her bangs. love her!! and love this post!!! So adorable, but she looks even skinnier than usual! Alexa is so inspiring! she has amazing style and is really unique, love her! Girly perfection is right! 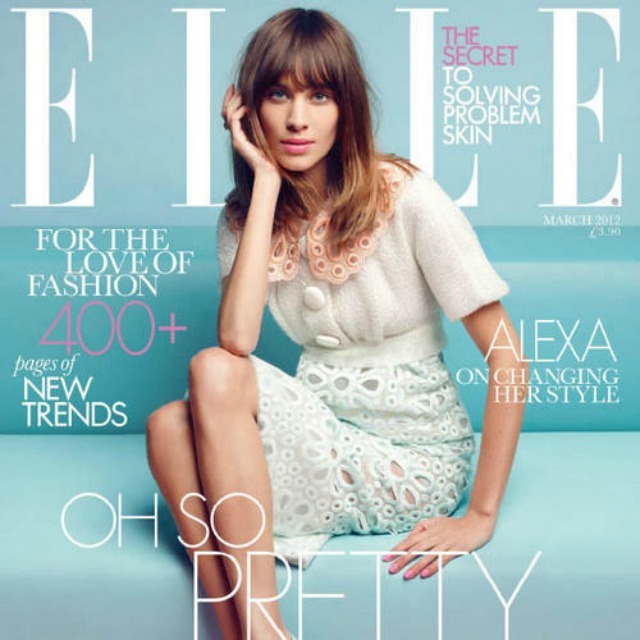 I just love Alexa Chung! That orange look is my favorite! And seriously, her legs are amazing. She is so gorgeous! Thanks for sharing! love these pics of her... so refreshing! Love these...but her legs look definitely edited in that first image...besides that...fierce! She is such perfection! I definitely like the longer hair! her clothes are the best!! i am sure that she is healthy and all, and i wouldn't want to cause any offence to her (or any of you lovely ladies either) but when i see the Laura Stones of the world rocking as gorgeous outfits while portraying a healthier body image i can't help but dig it a lot more. Absolute photoshop fail on the cover shot. She looks great, such a good editorial!!! loving the patterend wedges!! Just saw her on Fashion Police and I have to say I love her more after seeing her on the show. When asked who she dresses for, she replied, "children!" I thought it was so funny and perfect for her playful and girlie style. She has such a laid back, effortless style.. and these covers are amazing! ohhh...she is gorgeous and she is rocking it :)!! She looks gorgeous! I am in love with those green wedges! Alexa is WAY too skinny now! Its almost, sickening! Gotta worry about her, and the message she is putting out there. Ohhhh my!!!! Pizza, yes please!